“We depended on the coaching from our teachers [only]. After the theoretical training, we used to go directly to the patients,” says Yinebeb, referring to the shortage of learning aids such as patient simulators and other essential equipment in health training institutions in developing countries like Ethiopia. “It [was] difficult, for example, to explain feelings and senses when performing physical examinations,” recalls Yinebeb, 28, who now works at the Harar Health Science College located in Eastern Ethiopia. Simulation using models and activities that mimic the reality of patient care are an important component of the midwifery education and have been linked to marked improvements in retaining knowledge and skills, and in building confidence in students practicing health providers. The life-like simulators provide students with the opportunity to practice skills of various competencies before contact with actual patients. In 2011, the Government of Ethiopia revved up its efforts to close the shortage in its health resource workforce by expanding student enrollment while shortening the duration of the midwifery diploma course. To ensure quality midwifery students at graduation, the Ministries of Health and Education partnered with the U.S. Agency for International Development (USAID) through the Strengthening Human Resources for Health (HRH) project to support health training institutions with learning aids such as high-fidelity NOELLE® S550 maternal and neonatal birthing simulators to ensure a complete birthing experience before, during and after delivery. In the past five years, the HRH project has donated state of the art teaching equipment to 52 health training institutions, including Harar Health Science College, where Yinebeb teaches. The project has also contributed to the graduation of 38,891 new health workers who are contributing in saving lives of Ethiopians, improving health, and transforming futures. Yinebeb prepares the simulation model for his students (left). As a student, Mekdes Sisay demonstrates her skills during a hands-on training while Yinebeb assists. Mekdes says the college allowed students to practice even during off hours. “The skills practice made our exercises easy at the clinical attachments. I can say I have become more competent since the arrival of the simulation model than I was when I started the school,” Mekdes added. 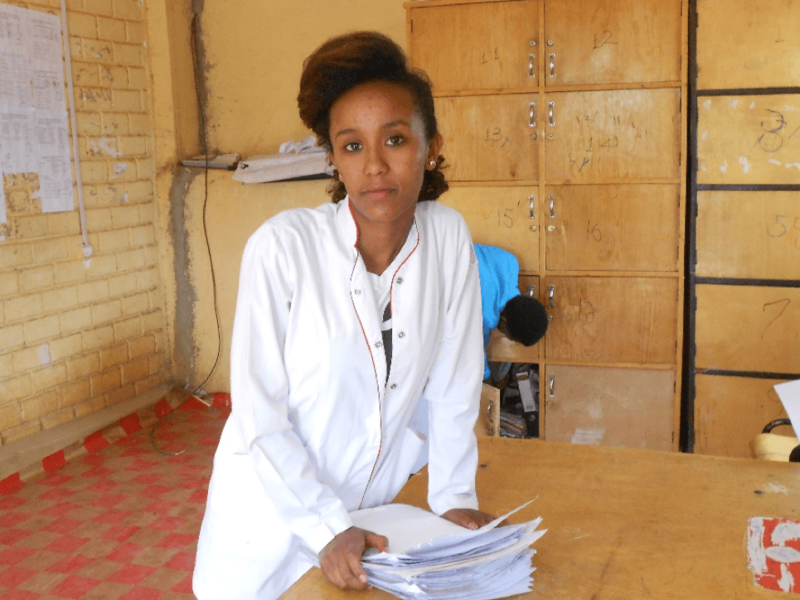 Mekdes, who has since graduated from Harar, is now working as a Midwifery Tutorial Assistant at Harar Health Science College. She is already inspiring her students with her skills and passion. “She is really good when she teaches and she tries to explain to us each detail while we are demonstrating. Moreover, she is young and easy to talk to,” said one of her students. Mekdes Sisay, from midwifery student to Tutorial Assistant. With support from the USAID HRH Project, more midwifery students are graduating with competent skills today and contributing in saving lives, improving health, and transforming futures. “I have already enrolled for a degree program so that I can teach and learn more. I aspire to be the best midwife. You can’t measure the satisfaction you get from helping a pregnant woman give birth safely. It is like saving two lives at once,” added Mekdes. Yinebeb couldn’t be happier. “Seeing my students become successful is encouraging and I look forward to the new batch,” he said enthusiastically. Muna Ahmed is the Communications and Knowledge Management Specialist for Jhpiego Ethiopia. Sharon Kibwana, Jhpiego’s Monitoring & Evaluation Advisor, and Dr. Tegbar Yigzaw, HRH Project Deputy Chief of Party, contributed to this story. Kibwana S, Haws R, Kols A, Ayalew F, Kim YM, van Roosmalen J, Stekelenburg J. Trainers’ perception of the learning environment and student competency: A qualitative investigation of midwifery and anesthesia training programs in Ethiopia. Nurse Educ Today. 2017 Aug;55:5-10. doi: 10.1016/j.nedt.2017.04.021. Epub 2017 May 1.